Delivery anywhere in the world. Shipment within 3 days. The new car’s doors have rigid fixation in the utter and middle positions, but after a few years fixation weakens. This is a common problem that occurs in every second car. The reason for this is that the door check fixators are worn out. When you are opening and closing the door, fixators are moving along the rod. The rod has recesses, and when fixators get into these, the door fixates. Over time, fixators wear out, but the rest of the door check works as it used to. So why buy a new check, if you can change fixators of the original one? 1. Remove the door trim. 2. Remove and disassemble the door check. 3. Replace worn fixators with new ones. 4. Reassemble in the reverse order. Plastic Auto is our own manufacture. Fixators are made of graphite-filled polyamide 6 (graphitocaprolone). This material is specially designed for the friction elements. Graphitocaprolone has low friction coefficient, and due to this, our products have a long lifetime. We give a 3 year warranty for our products. Why buying a repair kit is profitable? See for yourself: there is no point in buying the entire check assy if the problem solves by the replacement of only 2 parts - fixators. The complexity of the door check repairment and its replacement is the same, because in any case, you have to remove the door trim and remove the check. In addition, the price of one new door check for most car is at least $ 15, and for some it reaches $ 100. 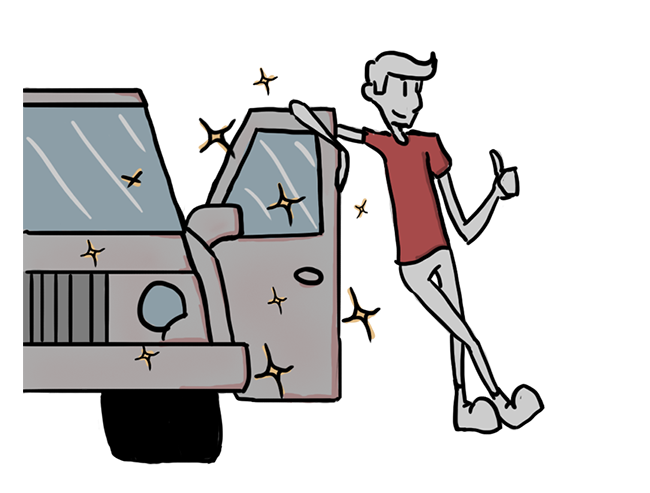 With our repair kit, you can repair 4 doors for $ 15, saving at least $ 45. Moreover, the quality of new door checks has become worse. Nowadays, manufacturers began to use cheap plastic, which wears out after 6-12 months. 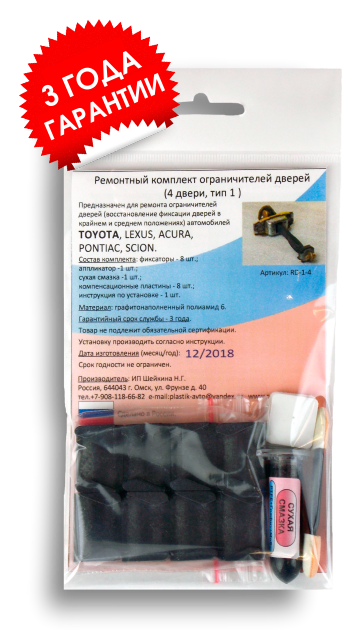 Buy our repair kits and enjoy the doors fixation, alike to a new car! to solve the problem, if the repair kit did not help or did not fit you. Couldn’t find a kit for your car? No problem! Contact us and we will find a solution together.